March is Bleeding Disorders Awareness Month! This event is an opportunity to bring awareness of bleeding disorders and the health challenges that come with them. Medical Daily defines bleeding disorders as a general term for a number of medical problems that result in poor blood clotting and abnormal bleeding. The bleeding disorders community in America includes over three million people who have Hemophilia, Von Willebrand Disease, and other rare bleeding disorders. Hemophilia is one of the most common bleeding disorders, while it affects primarily males, people with this rare condition want to share that they can affect females too. “It’s not only a male disease. I am a woman who is affected by the condition, along with two sons and a daughter”, says Yashica Elliot. Von Willebrand Disease (VWD) is an inherited blood disorder that results in improper blood clots. It is named after a protein found in the blood called von Willebrand factor. According to the Hemophilia Federation of America, VWD affects an estimated 1% of the world’s population. Unlike Hemophilia, VWD equally affects males and females. Symptoms of bleeding disorders such as Hemophilia and VWD are not always visible. “Just because you don’t see it doesn’t mean it’s not happening. And, it can be painful,” says Misty King Woodhall. A person living with a bleeding disorder may look healthy on the outside but patients diagnosed with severe hemophilia can suffer from painful, debilitating joint bleeds and associated mobility issues that severely impede their quality of life. The National Hemophilia Foundation (NHF) notes that people with mild Hemophilia A generally experience bleeding only after serious injury, trauma or surgery. In many cases, mild hemophilia is not diagnosed until an injury, surgery or tooth extraction results in prolonged bleeding. Why are Medical IDs Important for Bleeding Disorders? For parents like Emily Boyer, a blogger featured at the HFA Blog, having a child with hemophilia means they have to be vigilant about safety and when they are out and about this means making sure that if something happened, medical personnel know this very important, and possibly life-saving, bit of information. The Hemophilia Federation of America recommends medical IDs for patients with a bleeding disorder. In an emergency, having a bleeding disorder is a concern for first responders and medical personnel. NHF Emergency Guidelines advice that individuals with bleeding disorders should be triaged urgently and administering factor concentrate treatment should not be delayed. 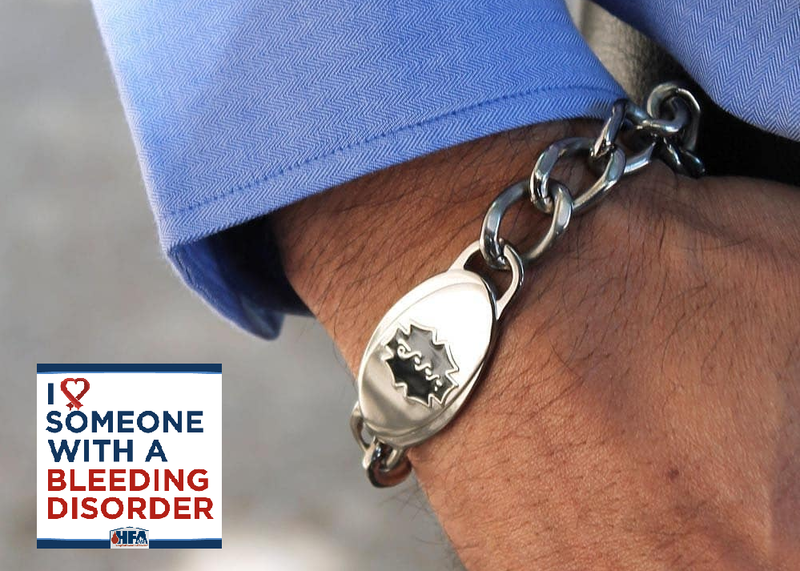 A medical ID bracelet or necklace can easily and quickly alert emergency responders of a bleeding disorder, especially when the patient is unable to communicate or if they become unconscious. The Emergency Medical Information (EMI) Guidelines for Health Care Providers in the Pediatric Hemophilia/Bleeding Disorder Population cites medical IDs as a beneficial tool for prompt identification of the medical condition, medical intervention, and in decreasing medical errors and overall medical costs. Do you have a friend or loved one who’s been diagnosed with a bleeding order? Please help us in raising awareness of why medical IDs are important for this serious medical condition. awareness month, bleeding disorder, hemophilia, medical ID, medical ID bracelet, medical ID jewelry, rare diseases. Bookmark.